My post-farmers market trip on Sunday resulted in this delicious dinner I cooked for my BFF Melissa, courtesy of Tyler Florence: Herb & Lemon-Roasted Chicken with Smashed Broccoli and Garlic. The more I cook from Tyler Florence, the more I love him. This came from his “Real Kitchen” cookbook. Tyler calls for marinating the chicken for at least five hours in an herb-infused oil — which made the chicken super tender and juicy. Yum. Add in the lemon slice and herbs you tuck under the skin before roasting, and the meat is exploding with flavor. I didn’t have bone-in chicken breasts on-hand, so I used chicken thighs, and it worked great. Just put one lemon slice under the skin per thigh. Sauteing the chicken got rather splatter-y given the oil marinade and additional oil in the pan, plus the fat from the skin. If you have one of those handy splatter screens you set over a pan, highly recommend you use. Those things are awesome. The thighs took longer to cook through than stated. Give them a little extra time. I skipped the pan sauce because I was starving after cooking the chicken longer than I expected. And it was still delish. So if you want to save some time, go this route. Putting the broccoli in a food processor didn’t work so well. It was pretty thick so I had to keep stirring it up to get it moving. If you have an immersion blender, you’ll save some hassle. Here’s the recipe…have at it! Start by marinating the chicken because it will take the longest. To infuse the oil with flavor and create a base for the marinade, combine the olive oil with the lemon zest, garlic, thyme, rosemary, and bay leaves in a small pot and place over very low heat. You don’t want to fry the herbs, just steep them like you’re making tea. When the oil begins to simmer, shut off the heat and let it stand for 10 minutes. Pour the fragrant oil, solid pieces and all, into a bowl and put it in the refrigerator to cool. Combine the chopped chives, parsley, and tarragon in a small bowl. Stuff 2 lemon slices under the skin of each chicken breast, along with half of the mixed chopped herbs. Put the chicken in a resealable food storage bag and pour in the cool herb oil, turning to coat really well. Toss in the remaining half of the chopped herbs, seal the bag, and refrigerate at least 5 hours or as long as all day. Remove the chicken from the refrigerator about 15 minutes before cooking so it won’t be too cold when it goes into the pan; cold chicken takes longer to cook. Preheat the oven to 350°F. Put a cast-iron (or regular ovenproof) skillet over medium heat. Drizzle the bottom of the pan with a 2-count of olive oil and heat until almost smoking; this will keep the chicken from sticking. Season the chicken with a fair amount of salt and pepper and put it in the pan, skin side down. Cook for 5 minutes or until the skin begins to set and crisp. Flip the chicken and brown another 5 minutes. Flip it yet again, so the skin side is down, and transfer the entire pan to the oven. You want the chicken to render its fat and the skin to crisp up. Roast the chicken for 20 to 25 minutes or until cooked through. While that’s in the oven, move on to the broccoli. Heat the olive oil in a medium pot; add the red pepper flakes and garlic. Throw in the broccoli and toss to coat in the garlic and oil. Pour in the chicken stock, cover, and let the broccoli steam for 10 minutes. When it is quite soft, pulse the broccoli a few times in a food processor, or better yet, use a handheld blender if you have one. The broccoli should be partly smooth and partly chunky. Stir in the yogurt to give the broccoli some body and season with salt and pepper. Transfer the chicken to a platter and keep it warm while preparing the pan sauce. Pour out all but 1 tablespoon of the rendered chicken fat and return the skillet to the stovetop. Add the chicken stock and lemon juice and cook over medium heat, scraping up the flavors with a wooden spoon. Cook the liquid down to a syrup, about 5 minutes. Stir in the butter to smooth out the sauce and turn off the heat. Spoon the smashed broccoli onto 2 plates, lay the chicken on top, and drizzle with the pan sauce. This is comfort food! 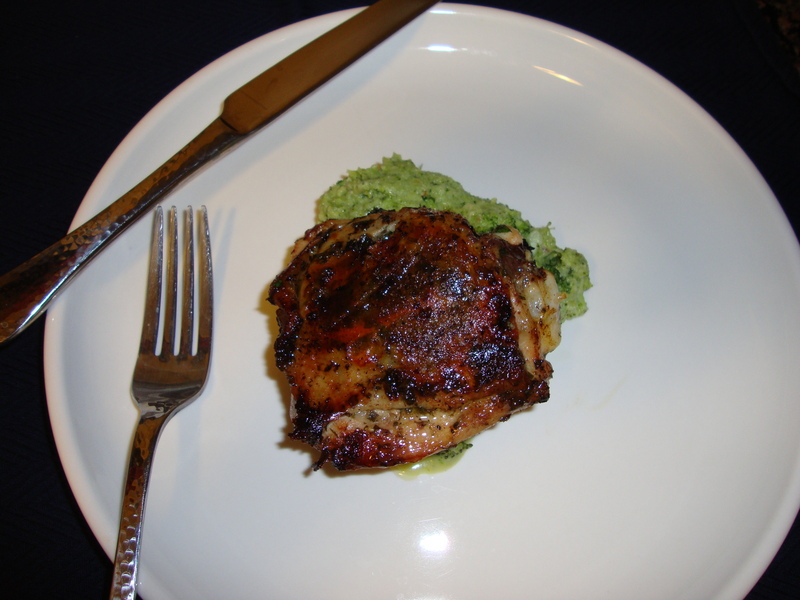 This entry was posted in Recipes and tagged broccoli, chicken, Tyler Florence by Tricia. Bookmark the permalink. This looks delicious. Lemon roasted chicken is by far my favourite method of roasting a chicken! Thanks so much! Can’t beat lemon-roasted.